Good luck smokers who are trying to quit cigarettes—you are going to need it . Most commentators in the media followed the FDA’s lead and focused on how minors can no longer purchase vaping products. But this is an inconsequential change because many states previously banned sales to minors and most stores already refused to serve customers who are under 18 years old. This small change obscures the true damage brought about by the FDA. To fully appreciate the harm the FDA has forced on vape shops and their customers, one needs to first understand the nature of the business. Vape shops primarily sell e-liquid, vaping devices, and associated parts. Since these goods are often available online at a lower price or tax-free, vape shops provide value to customers by offering education and assistance. Many types of e-liquid sold by vape shops do not contain any nicotine, and others that do are not derived from tobacco. Yet the FDA still claims it can regulate businesses that sell tobacco-free products under its tobacco control authority. 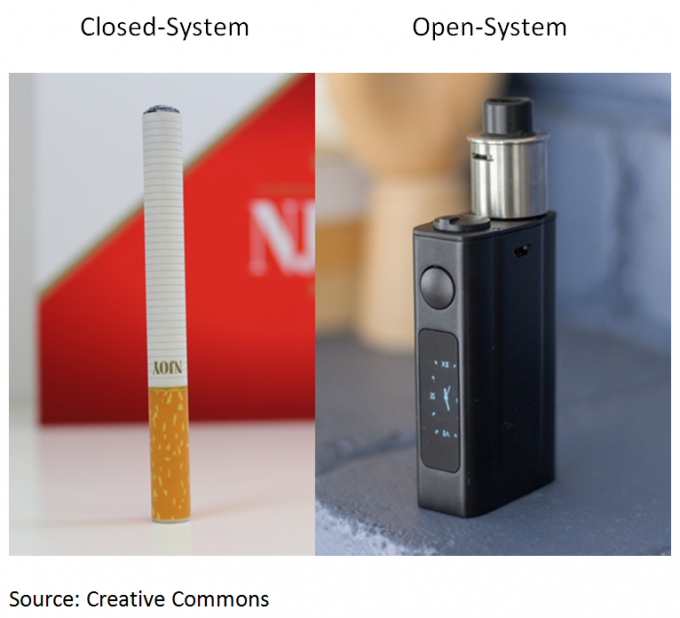 While using basic closed-system e-cigarettes bought at convenience stores is straightforward (just inhale the plastic stick that resembles a cigarette), vaping with e-liquid and an open-system device is a more involved process. The reason for this complexity is the amount of customization that vaping permits. Everything from temperature and wattage to flavor and nicotine level is completely personalized when using open-system vaping devices (see picture below). While basic e-cigarettes are a welcome way to introduce cigarette smokers to a safer alternative to smoking, high-quality vaping devices provide a more desirable experience. Evidence to support this claim comes from vapers’ lower propensity to engage in dual use—still smoking cigarettes while using vapor products—compared to e-cigarette users. Additionally, vaping’s growth in popularity was three times greater than the percentage increase in e-cigarette use during 2015. Vaping’s flavor customizability is especially important. The FDA now bans vape shops from giving out “free samples” of any newly-regulated tobacco products. This may sound reasonable at first, but it means that vape shops can no longer let customers test different flavors to see which ones they prefer. This was a regular practice because vape shops can carry hundreds of flavors, from limón dulce and churro to peanut butter banana and vanilla custard, and more options make it easier for smokers to find flavors that can help them quit. As well as not allowing free samples, the FDA prohibited vape shops from helping their customers set up or repair their vaping devices, which usually cost between $30 and $80. If someone’s vaping device breaks, and they cannot quickly get it fixed by professionals, it is easy to imagine that person going back to smoking cigarettes. Or, if cigarette smokers cannot figure out how to use their new vaping devices, there goes their chances of quitting. The FDA also banned vape shop owners from making true statements about harm reduction while educating customers. Reason’s Jacob Sullum explains that this decision comes from the 2009 Family Prevention and Tobacco Control Act, which prohibits any non-FDA-approved claims about lower risks from deemed tobacco products. Banned statements include saying that certain tobacco products contain lower amounts of substances found in cigarettes, or that certain tobacco products lead to lower exposure to substances found in tobacco smoke. This ban makes sense when applied to claims about light and low-tar cigarettes, which are neither safer nor healthier than regular cigarettes—but it makes no sense when applied to vaping. The 2009 Tobacco Control Act that the FDA continually cites did not mention vaping at all, as its focus was rightly on the dangers posed by cigarettes. Vaping gets its name because there is no smoke produced, which means that vaping creates neither tar nor the 68 other known carcinogens found in cigarette smoke. For this reason, vaping, while not completely free of harm, is at least 95 percent safer than smoking cigarettes . Yet vape shops cannot carry on their other primary role of educators because of the FDA’s power grab. Everyone knows that quitting cigarettes is difficult. The support and guidance provided to current and ex-smokers by vape shops is critical to the decline in the U.S. smoking rate. This decline is especially pronounced among high school students. The Center for Disease Control and Prevention’s National Youth Tobacco Survey found that cigarette use among high school students was 9.3 percent in 2015, down from 15.8 percent in 2011, while vapor products’ use among high school students increased from 1.5 percent to 16.0 percent over that time period. A new study in the journal Addiction finds that 6.1 million EU residents quit smoking cigarettes and instead use vaping products. The study also echoed the conclusions of countless other reports, including theCDC’s, and found that the vast majority of people who used vapor products were previous or current users of other tobacco products. The study also showed that than one-tenth of one percent of people who used vaping products with nicotine on a daily basis never used tobacco before. This finding, coupled with the absolute lack of evidence that vaping leads to smoking cigarettes, shows that vaping does not rapidly expand nicotine addiction nor act as a gateway to cigarette use . There are more changes coming to vape stores over the next three years. The FDA’s rules require costly pre-market approval in order for any existing vapor products to stay on the market. This will decimatethe number of e-liquids and devices that vape shops currently carry by wiping out an estimated 99 percent of the industry. Vape shops will also no longer be able to mix their own e-liquid, further destroying their profits and ability to meet customers’ needs. The positive effects of vaping compared to cigarette smoking should be celebrated, not curtailed by overzealous FDA regulations. Handicapping vape shops harms thousands of U.S. small businesses and benefits large cigarette companies. But, more importantly, doing so also condemns current and ex-smokers to a more difficult road to a smoke-free lifestyle. Though the most devastating parts of the FDA’s war on vaping are not yet fully phased in, one only needs to visit a vape shop to see that the negative effects of this government regulation are already clear.